As promised in my previous entry for this contest, here's an update on my progress for the goals I outlined in Week 1. It was a bit of a struggle for me with the "Daily 5" this past week. One reason was because it was Christmas, but the bigger reason was because of the situation with our cat. The short version is our cat had been declining in health over the last few weeks and this week ended up being his last. My concern was more for making him comfortable and knowing that he was loved than it was for my own goals. Next week though, I think the goals will be a good distraction to help keep my mind off of missing my little buddy. I was able to make some progress towards the re-design of my web site. And since Week 3 is about optimizing your site, I'm actually planning on having that goal completed by then. But for now, let's get started with Week 2 - Your Perfect Pitch. The point of this chapter is to really help you maximize your online and offline branding, to create your own Unique Selling Point, to create something that will give your potential audience a context about you. I remember back a few years ago when I was trying to do the band thing, trying to explain to people what we sounded like. We said the typical "we sound like us" statements that so many artists say. We didn't want to be pigeon-holed into sounding like someone else. We didn't want people to think we sounded like other bands, we wanted them to think we sounded like us! Looking back at it, how foolish we were. The book gives some examples of some of Ariel's client's pitches to help us get a jump start on the process. Then there was an exercise to fill out. The first part was to list out the genres that you typically play, which for me was Rock, Metal, Hard Rock, Pop-Punk and Alternative. Next was to write down all the artists that people say I sounded like. My list included the following: Sevendust, Slipknot, Foo Fighters, Breaking Benjamin, Daughtry, Nickelback, Metallica, Pantera, Steve Vai and Joe Satriani. Now it was time to write out my pitch. And to help test it out, it was suggested we log on to http://www.15secondpitch.com. I created a profile there and walked through the wizard that the site had for creating your 15 second pitch. Another term I've heard used to describe this is the "elevator pitch." Heard that term at least a dozen or so times at the TAXI Road Rally. So after going through the wizard to create your pitch, you're then shown the pitch and given a timer so you can test it out. Imagine a steel cage match between Sevendust and The Foo Fighters with Joe Satriani as the referee. The next step was to start implementing this pitch on my online and offline branding, starting with my web site's home page, myspace page, facebook page and any other social networking sites I use. Since I'm a non-performing artist, I don't really have a lot of offline branding that I'm doing, so I don't really have anything to focus on there but I have added it to my myspace profile, facebook fan page, twitter account and my web site. Coming up for next week is Chapter 3 - Optimizing your website. The plan is for me to have my new site all finished and rolled out at the time that I post the blog for Chapter 3, probably a week from today. Actually, let's make that a definite. One week from tonight I will post the review of Chapter 3 and will go live with my updated web site. Now I gotta start planning out my Daily 5 to make sure I get it done! Yesterday, December 29th, 2009, was without a doubt one of the saddest days of my life. 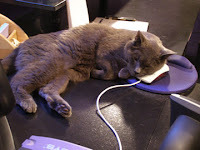 It was the day that we had to put our cat, Grey, to sleep. He was more than just a pet. He was family. He was my little buddy. He was one of my best friends. 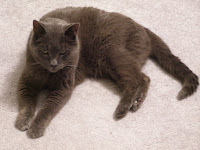 And he was the most un-cat like cat I've ever personally known. Had he made it another 2 months, he would have been 20 years old. So, while I'm grieving pretty hard for him right now, I know that he was blessed with a long and happy life. Rather... we were the blessed ones to have been given the gift of taking care of him while he was here on this earth the last 19+ years. Our adventure begins back in March of 1990 in Reynoldsburg, OH. One day while walking outside my future wife heard a faint squeaky sad "meow" type sound out in the distance. She walked down towards a field beside her house that was filled with waist-high weeds and also close to the highway. As she got closer to the field, out popped a little grey kitten. The cutest little kitten she ever saw, with a silvery grey coat of fur and giant ears, about two sizes TOO big for his head. She reached down and picked him up and began to pet on him (she did this to any cat she came across). He let her love on him and began to purr. But when she turned to take him to the house, he jumped out of her arms and went running back into the field, letting out little squeaky "meow's" the entire time, so she followed him in. He even stopped a couple of times to make sure she was still following him. He led her to a plastic bag like you'd find at Kroger or Wal-mart. The bag was tied in a knot but she noticed that there was a big rip in the side of the bag. The kitten started poking his head inside so she looked inside the bag as well. Inside she found another little kitten, a tabby, that appeared to be the same age as the grey kitten, about six weeks old. It was shivering and looked terrified. She pulled the kitten out of the bag and then grabbed the little grey one and took them both home. Her mom adopted the tabby and she kept the little grey kitten for her own. And she had him ever since. What a sweet little cat he was to make sure that his sister was found too! And how horrible it was for someone to tie two kittens up in a bag and throw them off the side of the road! But our little grey was a fighter, a hero. He wasn't going to let his sister die in that bag. A few years later, my future mother-in-law was emptying the groceries out of the car. She left a car door open and Grey, ever the curious cat, decided he wanted to go for a ride. Just as he was leaping inside, my mother-in-law started to shut the door. She didn't see him trying to get in and she shut the door on him. Fortunately, no ribs were broken, but it did result in him getting a very distinctive "purring" sound, much louder than typical cats. After that incident, he hated to be in a car and would meow his little head off anytime he was in one. It also made him snore at times, kind of a cute little wheezing sound. I miss that sound already. The first six years of his life he was forced to be an outdoor cat by my mother-in-law even though he often demonstrated signs that he wanted to be inside with the people instead of being outside and alone, such as darting inside the moment a door opened and once inside, hiding so he wouldn't have to go back outside. 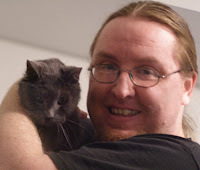 So six months after my wife and I got married in '96, we brought him home to live with us as an indoor cat where he was well fed, spoiled and pampered until the end of his days. One of the funniest memories of Grey I have is from the second year we had him when we lived in Nicholasville, KY. He loved to chew on our shoe strings. Well one day he was chewing on the shoe strings of my wife's winter boots. He got startled and the next thing you know he started to take off running down the hall. The one thing he forgot to do was let go of the shoe string. So as he went sprinting down the hall, he had one of her boots in tow right behind him, kicking him in the backside, which only made him more run faster and kept the whole process going. My wife chased after him the entire time, trying to get the boot string out of his mouth. I, however, was crying from laughing so hard at the sight of this poor little cat being chased by the boot. lol. There are so many stories about Grey that I could share, from him climbing into the back of the open dishwasher with it fully loaded, to announcing to us that it was time for him to go to the litter box, or hearing us turn on the TV in the bedroom and then seeing him sprint into the room where he'd jump up on the bed and proceed to crawl onto my chest and just plop down so that I could love on him. But there's one other memory that I'll always treasure. This past year my little buddy decided that he wanted to become my assistant engineer in the studio. I thought I'd give him a shot since I didn't really have anyone else there to do the job. But he wouldn't run any cables for me. He wouldn't turn on the lights. Pretty much he only did two things. The first thing he would do was wait until I had to record acoustic guitar parts and then proceed to act as if he was on Feline Idol or something. Maybe he thought we would become a singer-songwriter duo and take our act on the road. But the other thing he did was just so precious to me. He would come into the studio, whether I had a guitar in my hands or not, didn't matter what I was doing, and he would proceed to walk right over to the edge of my chair. He would then look up at me with those big eyes of his (imagine the scene from Shrek 2 with Puss 'N Boots), then proceed to put both of his front paws on my leg (or the front of the chair), and try to climb up on me, even though at this point, he really wasn't able to. So I'd pick him up and then he'd perch himself on me, both front paws dangling over my left shoulder, like he's trying to knead some dough, while I rub his belly and he rubs his head against my cheek, letting out that big ole "purr" sound of his the entire time, which was probably anywhere from 15-30 minutes at a time. Earlier this year, we noticed that Grey had really started to lose weight, even though he was eating more than he ever had. We took him to the vet and he was diagnosed with hyperthyroidism. He had some medication that we had to give him each day, but over the last couple of months, the medicine just wasn't working anymore. Last week we took him to the vet for a check up because he just wouldn't eat or drink. For the past week, we had to double up his medication but it didn't make a difference. Yesterday, I called the vet to give him the latest update. I dreaded making that call because I knew what was going to happen next. 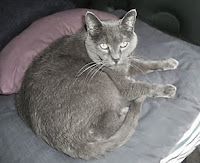 So after giving the vet the latest info, he told me what I was dreading to hear, but knew was coming, that it was time to bring Grey in and have him put to sleep. The moment I hung up the phone the tears began to flow. I had been trying to hold it in for the past week and just couldn't do it any longer. So yesterday afternoon, about 24 hours ago, we put our little buddy to sleep. Remember how I mentioned that he hated cars and would always let us know about it by meowing his little head off? Well, yesterday when we took him to the vet, for the entire duration of the ride over there, he never made a sound. We stayed with him throughout the entire process. It was hard to let him go, but we know we did the right thing. Doesn't make it easier, that's for sure, but we know that we did all we could do for him and that his time with us was done. After he was given his sedative, in typical Grey fashion, he proceeded to walk over to the scale that he would get weighed on and cozied up for his final nap. He loved to sit on things, whether it was a book you were reading or a notepad you were writing on. He liked to sit on it and claim it as his 0wn. I believe that he thought our house was his and that he thought he was being gracious by allowing us to live here and take care of him. Earlier today we buried Grey in our backyard. We bought a black wicker box to put him in, one that he probably would have tried to crawl inside of and take up residence in if he were still alive, especially if we needed it for something else. As if saying goodbye to him wasn't hard enough, trying to get the hole dug, proved to be a challenge as well. Between breaking my first shovel, the ground being more mud than dirt, constantly running into tree roots or underground tubing that the previous homeowner had installed to help drain water away from the house, I thought I'd never be able to get it done. But I finally did and we were able to lay him to rest. In the words of the famous professional wrestler Bret "The Hitman" Hart. When it comes to Grey... he's the best there ever was, the best there ever is, and the best there ever will be. As I mentioned in my last entry, I've entered myself into a blogging contest for Ariel Hyatt's book Music Success In Nine Weeks. I'll be doing a total of nine entries, one for each chapter, over the next nine weeks. The first week is about "Getting Mentally Prepared." One of the things that Ariel talks about in this chapter to help get you mentally prepared is the concept of setting goals, both short term (daily) and long term (year from now, lifetime). I'll be honest. This chapter has been a bit of a challenge for me, mostly because it's forcing me to "dream" a bit. Let me explain that a bit. I joined a company called TAXI in January of 2008 with a long term goal of getting some of my music placed in film and television. Well, honestly, when I first joined, I was hoping that it would be a "short" term goal, but I quickly learned that, for the most part, the music business, especially film and TV, is a very slow moving process. Back to that goal... I spent the first year really learning the ropes so to speak. Figuring out how to improve my recording and production skills. Then this past year, all of the blood, sweat and tears that I had been putting in started to pay off. My songs started getting signed to different music libraries. I had some placements on MTV. I scored the music for part of an indie documentary film. I landed a spot as a composer for a daytime talk show. And most recently signed an exclusive deal with a publisher overseas. And while all of those things were part of my "generic" goals, none of them were things that I would have written down as specific goals (with the possible exception of MTV). Which brings me back to the book. Part of the "homework" in this book involves writing down five successes that we hope to accomplish each day, but not all of them will be music related. They can be something as simple as doing laundry to something a bit more involved like composing an orchestral piece. The key is to get in the habit of doing something positive each day and not to focus on the negative. I'm a pretty even-keeled person, so not focusing on the negative isn't really that much of a challenge for me. But one thing that I think I'll benefit from by doing "The Daily 5" will be to help me keep a bit of balance in my life. When I put my mind to something, I go for it at maximum velocity with every bit of energy that I've got. And while that can definitely be a good thing, it also means that sometimes I might neglect other aspects of my life that need tending to. When I got focused on something, I just block out any distractions that might get in the way, whether they're an actual "distraction" or not because I am focused on the end result, and I'm too stubborn (thanks Granddad!) to quit or give up. It's recommended that your Daily 5 include tasks that will help you work towards achieving your goals. By doing something every day, no matter how large or small, you're at least making progress towards achieving the success that you're hoping for. Every little bit helps. I'll be sure to include an update on my progress when I post the entry for the next chapter. And for those of you that know me, you won't be surprised to hear that a "lifetime" goal is to have one of my tracks used during the broadcast of a Kentucky basketball game (or highlight package) on ESPN or CBS. That, quite honestly, would be a dream come true. Well, that's all for this week. I hope everyone has a wonderful Christmas and I'll be back soon with my report on Chapter 2! Earlier last week I got an email from Ariel Hyatt talking about a blogging contest that she was going to be doing in regards to her book, Music Success In Nine Weeks. I wanted to take her class at the TAXI Road Rally last month but it was up against another session that I also wanted to see so I didn't get to take it. But, as it turned out, I had a chance to meet her during one of the lunches while I was there. When I first got the email I really wasn't sure if I wanted to do the contest or not. There were basically two reasons for my indecision. The first reason was that I'm not trying to do the traditional artist route anymore. And though I knew that the book was not strictly for the traditional artist, I still wasn't sure just how much of a benefit it would be for me. The second reason was simply this... time. By doing the contest, I knew that it would be taking up quite a bit of time. And at the moment, time is not necessarily a commodity that I have loads of currency in at the moment. And as much as I'd like to, I seem to have difficulty in maintaining an active blog. But the more I thought about it, and the more feedback I got from some friends of mine (some of which are also going to be doing it), the more I decided that it was probably an investment worth making so I got the book earlier this week and plan on starting it this weekend. I know it's going to be a lot of work, but I'm looking forward to the challenge!